"Lucy, I know you're there and you're not scaring-" I stepped out of my room and realized that no one was in the hall. I marched over to Lucy's room grabbed the handle and pulled with all my might while the voice was still yammering on in my head. I gave the handle another jerk. The voice was seriously annoying me now so I ran to the bathroom, yanked open a drawer, grabbed a bobby pin, and ran back to Lucy's room. I picked the lock and barged into her room. "Lucy stop it!" I yelled. Lucy turned around, she was on the floor playing with her barbies. "Uh, nothing. Did you hear something?" I asked. "No, did you?" Lucy inquired suspiciously. "No" I lied. The voice was still repeating in my head. "Come to me. Tap me three times." It said. "I was just wondering" I told Lucy. "O.K." I said heading for the door. I walked to my room and sat down. The voice started saying something else. "Come to me. I'm on your window sill. Tap me three times." my eyes wandered to the window sill. The orange sea glass was moving! I went over and picked it up. "Tap me three times" I tapped it three times, it didn't burn me, instead a tiny brown bird flew out. "Phew" the bird said "It feels good to be out of the sea glass." I was so surprised I fell on my bed. "Eliza I'm going to go to the grocery store, take care of your sister" yelled my mom from downstairs, momentarily taking me out of my surprised state. "O.K" I yelled back and then turned toward the bird "What's happening?" "I'm taking you on an adventure. My name's Fiddlesticks. You always have to keep the sea glass with you at all times" the bird chirped a-mile-a-minute. "What kind of adventures? I'm Eliza, I don't have pockets. How do I keep the sea glass?" I thought out loud. "Oh yeah, I'll make you a necklace." Fiddlesticks found some wire and string and soon had a necklace. I slipped it over my head and the bird landed on my shoulder. "Close your eyes, you'll be on your adventure soon" he said. With that I left my room for a very long journey. We went snorkeling near Great Bird Island. There were some really cool coral and sea anemones. I like snorkeling a lot because of all the pretty (and ugly) sea life. We moved to Barbuda. The guide book says it has a wonderful "pink" beach, but no matter how much you squint it just isn't pink. Any beach is a good one though and this one is super awesome! There are big waves that Remi and I 'Mia surf' on. Mia surfing is when I body surf with my head underwater and Remi sits on my back and enjoys the ride. We also like to sit in the breaking zone or where the waves break and let the waves tumble us around. In Barbuda we learned how NOT to beach a dingy. We accidentally almost capsized the dingy. Dad fell out and everything flew everywhere. It wasn't what you would call a successfully dingy landing. Anyway, nobody was hurt and we all had a fun time on the beach. Now we are back in Antigua and yesterday was Hero's Day here, which is just like our Veteran's Day. All the local kids got the day off and a bunch of them hung out on a beach, that we were anchored near. We spent the afternoon playing in the sand and swimming with them. It felt good to have 'kid time' again because the last time we spoke with kids was almost a month ago. It was a fun way to see how locals spend a day at the beach. They caught a bunch of fish including a stingray when they were spearfishing! They grilled and had fun in the water. We made sand balls together, which the local kids called snowballs. When we asked if they had ever made actual snowballs out of snow, they said that they have never even seen snow! Well, for all those people held in suspense from my story here is the second chapter. I woke up to the sound of muffled cries that I couldn't make out. As I tried to hear what they were saying, I realized that I was still underwater. Thousands of questions buzzed in my head. How did I get underwater? Why was I underwater? How long was I underwater? Unfortunately I didn't know the answers to any of my questions. I kicked hard until my head popped out. I heard that the the muffled cries were talking to me. "Eliza, where are you, Eliza?" the voices cried. I turned around and there on shore was my family. I swam fast towards them. "Where were you? We looked for the top of your snorkel but, we couldn't find it. I was so worried." my mother said frantically. "I was right there." I said pointing to the place I was. "I was just underwater." "For half an hour?" Lucy my 6 year old sister said. "Really? It was that short I thought it was longer." my mom said to no one in particular and then turned towards me and said "Eliza, you couldn't have been underwater for half an hour. Where were you?" "I don't know." I replied. Lucy snickered. "Well, what do you have in your hand then?" she asked. I slowly uncurled my fingers to reveal a piece of sea glass that looked exactly like the sun. All the memories came rushing back. The dive under, the burning pain, the black out. What had happened down there? I wondered and so badly wanted to say. Instead I turned towards Lucy and said "It is just some sea glass, I'll probably throw it back." I knew the sea glass had some hidden mystery that my body was just aching to find out. I also knew how valuable orange sea glass is. All the reasons why I shouldn't throw it back swirled around in my water logged head and my gut feeling, throwing it back because it might be dangerous, was over powered by the curious part of me. I held on to it the whole ride home and then put it on my window sill. The local girls were really cool. A lizard on Great Bird Island. Now that were in the Caribbean life isn't that bad. Yesterday Sterling flew back to Panama and we moved to a really cool anchorage. The water is super clear so, we went snorkeling. We saw the anchor in the sand, sea cucumbers, and starfish. Then we went to the beach and played in the sand for a while, when we swam back it felt like swim practice because Mom had me do breaststroke and head high crawl. It's really relaxing here and I started writing a story called "Skip Chaser" the sailing adventure of an 11 year old girl. Here is the first chapter. White sand, beautiful white sand, rocks, and shells was what I saw. Something caught my eye, a shimmery orange glint. I focused on the bottom of the ocean, a orange piece of sea glass about the size of a quarter, lay beneath me. I gasped and then realized I shouldn't have, as my mask fogged up when I did. I knew that if I went to a place where I could touch the bottom to de-fog my mask, I would lose the sea glass. I started treading water, closed my eyes, and pulled off my mask. I carefully tried to stay in the same spot so I wouldn't loose the sea glass and smeared spit in the inside of my mask. I put it back on and looked for the sea glass once again. There it was, an orange glimmer. I took one last breath and dove down as the top of my snorkel submerged. I kicked hard with my right arm outstretched reaching for the sea glass. Almost there and I grabbed it. A shock of electricity hit me. I lifted my hand away from the glass instinctively, but the glass stuck to me. The pain became unbearable and the world went black. I'll post the second and third chapter on the next blog. Today is the last day of a seven day passage from Bermuda to Antigua. I hate passages a lot. One of the reasons I hate passages is that I get seasick. Imagine if your house was tilting and flying up and down side to side, you wouldn't feel too good either. Not only does the motion make you seasick but it also makes it incredibly hard to do stuff, like go to the bathroom and sleep. The second reason I hate passages is that I need a change of scenery and people. I you were stuck on a 37' boat with 5 people for a couple of weeks, you'd know what I mean. The last in reason I hate passage is that this passage is really hot. A couple days ago (on Sterling's birthday and Thanksgiving) it was in the 90's. For all those people back in the states with snow on the ground, YES, I said 90° on Thanksgiving! The heat would be fine if all the other things that I hate about passages were gone, but they're not and I'm not fine with the heat either. There is also two things I like about passages. The first one is seeing dolphins, they jump around our bow and leap out of the water really fast. We have seen 2 pods so far. I think seeing dolphins out here is cooler than going to a park to see them because it is guaranteed if you go to a dolphin park but when you are in the middle of the ocean it's not guaranteed, but when you see them it's so cool. Can you guess what the second thing I like about passages is? If you guessed watching Sterl trying unsuccessfully to catch a fish you guessed correctly! Sterl hasn't caught 1 fish on the passage yet and we have gone almost 1500 nautical miles! He has lost 3 lures and numerous hooks from snapping 50 pound line. He now has 100 lb. line but the hook keeps breaking. Oh well, maybe not a fish on this passage. NOW WE ARE IN ANTIGUA!!!!!!!!!!!!! It feels so good to be here. Yesterday Remi, Mom and I hung out a pool while Dad and Sterling were at the bar. Oh, and Sterling caught a fish three hours before we reached Antigua! It was a small tuna, so he says we we will have sushi for breakfast since Mom brought sushi rice and wasabi just in case. It is a really cool place and it's almost worth the passage. We wouldn't think that the Caribbean was as cool if we flew there because after a passage we really appreciate things. This is such a cool place and the passage wasn't too bad but, I wouldn't want to do it again. I made kites out of old grocery bags. We found a pool in Antigua, Remi really likes it when I throw her up in the air. The beach was really fun. Here is a poem about the things that I missed on the passage. Well here we are, on the second day of our passage. We are in the Gulf Stream right now and I seem to be enjoying it a lot more than I expected. Maybe that's because I have been watching Harry Potter and the Deathly Hallows Part 2 most of the time. Today a tiny bird I call Fiddlesticks came out of nowhere and landed right smack in the middle of Sterling's lap. This fearless bird really likes Sterling, he even slept with him! We have a hard time walking around when the boat is heeling and it takes a lot of energy to go to the bathroom. I also don't like sleeping on the upper tack because I keep falling out of bed. 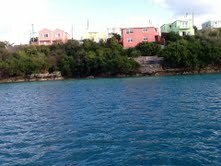 Now we are in Bermuda, after a six day passage. We didn't plan to come here so we didn't have paper charts or a courtsay flag. We say that we got sucked into Bermuda because the currents and the winds were favored to go towards Bermuda and on the day before we came here we found out their was a low pressure zone developing in the Caribbean, and Bermuda was a convenient place to sit it out. We thought the passage was pretty hard but our friends on Skylark have a dog, imagine how hard it would be for a dog on a passage. Dogs already have hard enough time going to the bathroom but when the boat is heeling and they have to go on the aft deck wearing a life jacket! 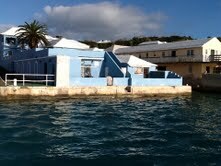 Bermuda is a really cool place, I especially like the blue water. 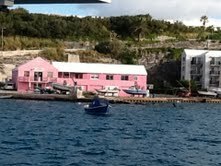 Bermuda is known for its pink sand and brightly colored houses, I will post some pictures of the houses but we haven't gone to the beach yet so I will post some pictures of the beach as soon as I go there. We are going on the passage to the Caribbean in a couple days. A passage is when you go out in the middle of the ocean and sail for days without stopping. The passage we are doing is about two weeks long so we will be out of contact for about two weeks because their is no wi-fi out in the middle of the Atlantic ocean. We will do shifts. Being on shift is when you are in charge of steering the boat. The trip is about two weeks long, but we might get there faster if there are good winds and it might take longer if there isn't that much wind. My uncle, Sterling is coming tonight to crew for us. He is going to sleep in the v-berth while Mom, Dad, and Remi sleep in the big bed in the aft cabin and I get the little bed in the aft cabin. I am going to get a lot of school work done so I don't have to do that much when we are in the Caribbean. We'll probably fish, read, watch movies, play games, and eat a lot to keep busy. I think we'll see whales and dolphins on the trip. And we might see some big ships. And I plan to make a project about what I see. When we get there it will be hot and I will play on the white sand beach. Do you like sea glass? I do! Sea glass is glass that is tossed in sand, water, and rocks. Afterwards it is "frosted" and not sharp. To cheat and make sea glass, put glass in a tumbler or put some rocks and glass in a mesh bag and tow behind your boat. Orange sea glass is the most rare color. The chance of finding an orange piece is 1 in 10,000.Purple sea glass is rare too, the chances of finding one is 1 in 300. Old purple glass has manganese in it. It started out clear but the manganese in it makes it turn purple in the sun. Purple is one of the most desired of sea glass colors. I didn't know all the history behind purple sea glass when I reached for a 80 year old amethyst piece of glass on a beach in East Greenwich, RI. I was talking to some cruisers, that knew alot about sea glass, and I showed them some of my collection. When they saw the purple one, they freaked out! When I heard the story behind it and how valuable it was, I was proud. Sea glass comes in many other beautiful colors including pink, black, green, brown, blue, and many more, so start collecting today! Here are some of my favorite pieces. I'm blogging here from Tangier Island, Virginia. Tangier is a beautiful island floating 14 miles off the coast of Virginia. Tangier is slowly sinking due to erosion. There are a lot of golf carts and electric scooters on the island because the roads are too small for cars. However we saw 1 small "Police" car. We went to a little museum that has an old stove in it that the dock master used back in the thirties. There was a lot of interesting things on Tangier, here are a few. Do you think you've seen a lot of cats, like 4 or 5 in 1 house? Well you obviously haven't been to Tangier. Tangier has sooooooo many cats. Almost everyone on the island has at least 5 cats and Mr. Parks, the dock master, even has 26! He says that you get a free night for every cat you take and whenever we pass his house to get to our dock a parade of 20 kitties greets us. I really like one that I call Tangerine. She always hangs out on the dock "guarding" our boat. She even got on Borealis once! She always stands out in a crowd of her black buddies because she is a tortoise shell. That's all I know about the cats on Tangier, but read on to learn about the visit to the beach. The beach on Tangier was amazing! It was sandy, white, and beautiful. Remi and I dragged logs around, when we finally found the right place, we built a hut. We weaved grass and used that as floors and roofs. We also wrote with charcoal on the logs. It looked really nice, I liked that beach visit! When we went to D.C. a couple days ago, we went to the Bureau of Engraving and Printing (a.k.a. The Money Factory). The Bureau of Engraving and Printing is the place where they make 1, 5, 10, 20, and 100 dollar bills. When we first walked in to the Money Factory there was a million dollars in 10 dollar bills! On the tour we took, we learned that they redeem old torn or damaged money. They redeem about $30 million every year! They also change the design of the bill every 7-10 years to help prevent counterfeiting. When we were watching the people make money, an employee tried to hand me a wad of money to me through the glass. I tried to grab it but the glass was in the way. Then he held up sign that said $400,000 on it and pointed to the wad of money he tried to hand me. After that he held up a sign that said "free samples" everyone got excited and he turned it around and it said "yesterday". There was also another sign that said "I just printed the equivalent of my life's salary in a couple seconds!". It was super fascinating watching them make money, I really enjoyed all the tricks and techniques they made the money with. One example is that they use a watermark. A watermark is a picture embedded in the paper, only see-able when you hold it up to the light. You can't scan or copy watermark so it helps prevent counterfeiting. Also they use color-shifting inks. Look at a dollar bill and move it around. The ink is green now it's black and its green again! If you want to learn more about $ go to their site http://www.moneyfactory.gov. We also went to the Annapolis Sailboat Show. At the boat show some companies gave out key chains and at the gate we were challenged to get as many as we could. The recorded was 19 key chains and we just beat it with 20. Here are all our key chains! We went to the super-busy-compared-to-Maine, NYC. There was a place that had really good build-your-own-burgers. I had lettuce, carrots and pickles on mine. Then we took a stroll to see the big screen in Times Square. We saw a guy that was shirtless and doing exercises with a stretchy rope on the fence of a subway station. Weird, usually you see people doing that in a gym, not in a subway station. When we were done sight seeing we took a train back to Port Washington. While we were on the train we saw the Mets stadium and the place were they hold the US Open. I liked how you could walk everywhere in a city and I especially like New York City because of the signs that light up bright in the evening sky and turned and moved every which way. I enjoyed watching all the different cultures and all different fashions. It was SUPER awesome!!!!!! MITseaAH, (mitt-see-ahhhhh) the mega sailboat yacht that we docked next to in Port Washington was enormous! It had a swimming pool and hot tub on the bow, a retractable mast, a hydraulic center board and air conditioning. It's cockpit was larger than our boat and it's spinnaker pole was taller than our mast. To top it off they had a crew of 7 including a chef and an engineer on board. It had a stern thruster and a bow thruster. It went 25 knots and it could plane! They used 250 gallons of fuel and hour, while we use only 1 gallon an hour. I won't even get into how much water they use, all I am going to say is that we use 4 gallons a day and they use much, much more. Remi wanted to write a little bit in a blog, so here is her perspective of New York City. To drink out of it . It was busy In NYC. We whet on a train it was fun . It was dirty at the train station. We heard a lot of different languages . people were protesting . It was loud ." I am spacing out in a restaurant. I am blogging off of my new iPad. We are in our home port in Rhode Island. We left our car here so we have a car now. We have been doing a lot of driving, doing every thing we can think of like getting haircuts, going to Staples, getting boat cards, doing a big Wal-mart run, going to the Newport Boat Show, going to Dad's old work for family day (We saw Emily D. there), and even visited Stow. We can definitely feel fall coming, (we turned on the heat a few times in the morning) so we can't wait to head down south. We start for the Chesapeake soon. Yesterday we went to Dad's work for family day. First we saw Dad's old office, then we went outside to eat and we sat next to Chris who inhaled 4 burgers in a couple minutes! After that we saw some of Dad's friends. While we were talking to them the ice cream trucks came. Remi and I waited in a ridiculously long line when we found out they were giving away free ice cream. When we finally got to the front of the line and ordered, Chris came and pretend to be our Dad so he didn't have to wait in the long line to get ice cream. After we chowed down our ice cream we went to see a presentation with Chris, Bill, Margaret, Susan, and Eileen. Chris decided that he was special because he had a bright green shirt on and tried to go into places that were blocked off. We finally got to the presentation we went there for. We realized we were too early. Since Chris could not wait, we decided to go see the big screen demonstration instead. Later that day we went to Larry's house and hung out with Jeff and Allison. After a few hours of Band Hero on the Wii, it was time for dinner. We had pork and we sang opera about the ingredients on the raspberry limeade bottle. After dinner we had an interesting game of Set that Jeff or Remi won (we couldn't tell because Jeff gave all of his cards to Remi). Do you remember the kids, Sadie and Lilly on the Valiant 40’? They have been in my previous blogs about Isleboro. Well, we met up with them in Pulpit Harbor. We saw the looming pulpit rock home to the vast nest of the osprey as well as a bunch of seagulls. We anchored in a little cove that was in Pulpit Harbor. We set up the horses (fenders are tied between 2 poles) so Remi can practice her riding without bringing horses on board. When Lilly and Sadie came we played on the horses and then we climbed on their boom. We also went into their room on their boat and we covered all the hatches and turned off the all the lights and it was pitch black. We built a fort in their room in the dark. It was super fun. We ate together on Borealis. The next morning Dad pulled us in Aurora (the dingy). We were on the boogie board and Dad said that we weren’t going fast enough so we dropped Remi and Sadie at the fishermen’s dock. We went really fast because there was less weight in it so it planed and it was super-duper fun. I hope we can see Lilly and Sadie sometime again. I haven’t blogged in a while because my iPad crashed so we had to go to an Apple store to fix it. The people at the store couldn’t fix it so they gave me a new iPad. I will catch up on my blogs soon so keep checking. Nothing has exciting really happened since my last blog.... EXCEPT HURRICANE IRENE! Well it actually was only Tropical Storm Irene when it hit us, but it still had about 25mph winds as well as gusts of up to 40 (we were in a hurricane hole so it wasn't as windy here as outside of Bucks Harbor). I wasn't actually on the boat when Irene hit, neither was Mom or Remi. We were at the yacht club that was generously left open for people that didn't want to be on their boat during Irene. There was two dogs named Matty and Sapphire at the yacht club. There was also a cat named Hobo. The animals were there with their owners that didn't want their pets on board during the storm. When I stepped outside the wind almost knocked me over. We started our first day of school while waiting for the storm to pass. I did 8 pages of E.D.M. (every day math) and for my friends back in Stow that are starting school tomorrow, scroll down for the answers. Just Kidding, Sorry you can't get them out of me that easily. We slept at Don and Polly's house and we came back to the boat in the morning. Hobo the cat is on a leash. That's his carrier in the background. We took a nice long sail to Frenchboro. Frenchboro is the little town on a little island called Long Island. No, it is not the one in New York. The population is 70 people. Now do you see the difference? Frenchboro has a school that has 12 kids, two teachers, one room, for grades K-8. There isn't a high school on the island so most families have to move off the island for their kids to attend high school. Once there was only two kids left in the school and when they had to go to high school the town would have to close the school. So this wouldn't happen they got 14 foster kids to live in Frenchboro. Only two have returned to Frenchboro after high school. The only way you can get to the island is by boat and the ferry only comes three days a week and even less in the winter. 3/4 of the island is uninhabited. It has one paved road and not that many cars. Most people catch lobsters for a living. We went to a little restaurant that was so small all of us couldn't fit in it. I got a loaded cheeseburger that was gone in three minutes. The chef/waitress/host's husband is a lobster man. He brought some lobsters that were strait out of the lobster pot. There was a really big male that was really fun to play with. It's not a Maine beach, but it's definetely Maine water! The day we left Bucks Harbor we went to Northeast Harbor where we stayed for one night. There was an ice cream social and they gave away free ice cream. There was also a really good bakery that had really awesome donuts. Then we went to Somesville where we took the bus to Southwest Harbor and Bar Harbor. I especially liked Bar Harbor. It is really fun because there was a lot of stores. We went to my favorite breakfast place called Two Cats Cafe and it actually has cats! It is my sort of place. In Somesville we got bait bags and we filled them with smashed up snails and muscles and we caught crabs. We caught 6 on the first day, 2 on the second day, and 5 on the third day. We attached string to the bait bags and lowered them into the water. We stayed in Somesville for five days and then we went to Roque Island. There is a white sand beach in Roque Island. It is pure white sand and I have never seen a beach like that in Maine. It was so clean that the sand squeaked! We saw 4 kids there, Riley, Wren, Owen, and Liam. We played capture the flag. For the flag, Wren, Owen, and Remi used a towel. They buried the towel and we couldn't find it afterwards. We found it eventually, but it was hard. We then decided to play in the sand we got all sandy and then forced ourselves into the freezing water to wash off. Today we moved to Bunker cove. It is quieter here but we can't go to the beach. On day 20 we went to a dingy raft up. There was over thirty dingies there. A dinghy raft up is when dingies from a certain cruising club meet and tie up on the end of a boat. We passed around food and talked. It was so much fun. The next day we went to a potluck. A potluck is a event were you bring food to share. We went there to meet other families, but we were the only kids there. Fortunately we saw a sailboat that had some kids on it. They were named Sadie and Lilly. We ran out side and started waving they anchored right next to us and they came over right away. It turned out that they were just out for a short day trip and weren't planing to stay. The had nothing on the boat except for crystallized ginger and honey from their own bee hive that they gave to us. We went to their grandparents house for breakfast and we trained their puppy, Niño, to jump. Niño won first place in the Islesboro dog show. We went to Sadie and Lilly's neighbor's house and jumped on their trampoline. Then we went to Holbrook. Dad pulled us on the boogie board behind the dinghy. I went really fast and I planed. I'm glad I didn't fall off, the water was freezing. The next day we went to Buck's Harbor. We went to the farmers market. At the farmers market we saw Hannah. Hannah is a friend of mine, I met her the first summer we went up to Brooksville, Maine, 4 years ago. We played tennis with her at the yacht club ate ice cream with her and then I had a sleepover on the boat with her. It was really fun! Yesterday we had lobsters for lunch! Even though they are not my favorite food they are still my favorite animal. We saw a lobster boat. We pulled along side him and asked for lobsters "No" the fisherman said in a trying-to-be-tough sort of voice. His excuse was that he had an order to fill. He turned around and we turned to go, "Wait! How many do you want?" we answered "just one or two" and he pulled up a pot took two lobsters out and threw them in the dinghy, without the bands on the claws! We tried to pay him but he refused to taking our money by driving off. We couldn't figure out why he had changed his mind so fast, maybe it was my lobster earrings, shirt, and bracelet, Remi's fascinated look, or the thought of a laugh from the chaos and frightened attempts to get away from the snapping claws unraveling before him in the dinghy. A little later that day we went to a small beach were Remi and I played in the water and mom and dad sunbathed. They didn't look up until I started dragging ten foot long logs around and even than they just said "Be careful". That went on for about 30 minutes until it started raining. When it did we ran into the woods and despite getting our swim suits caught in prickly trees, getting scraped on sharp bushes, falling branches (Thanks partly to Remi), and stepping in numerous piles of deer poop we finally got to a soft moss clearing where we found out that it had stopped raining as soon as we got there! So we made the long trek back to the beach that with almost the same incidents and some new ones, like Remi getting lost, but we got out eventually. To Remi and my delight, we found that our logs had not drifted away in the "Storm". After this journey into the woods, we only came up with one conclusion "Maine parks are nothing like Massachusetts ones.